A mosaic plot is a square subdivided into rectangular tiles the area of which represents the conditional relative frequency for a cell in the contingency table. Each tile is colored to show the deviation from the expected frequency (residual) from a Pearson X² or Likelihood Ratio G² test. 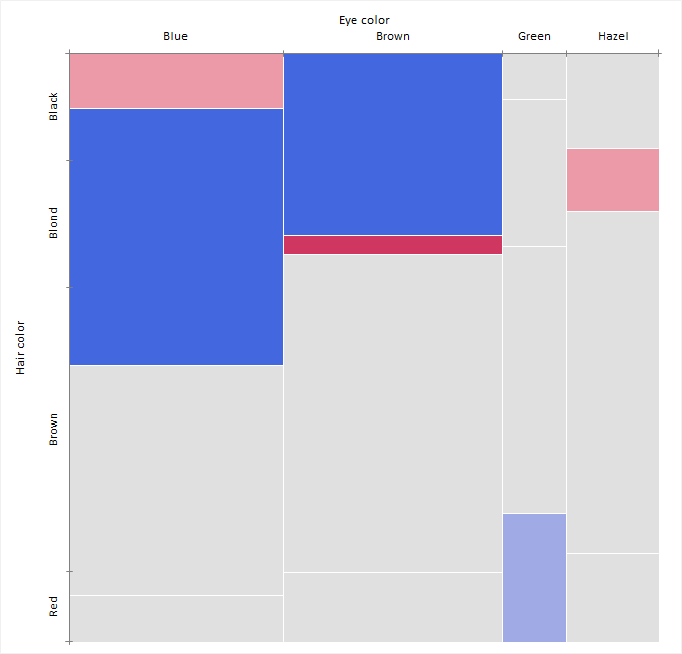 You can use the mosaic plot to discover the association between two variables. Red tiles indicate significant negative residuals, where the frequency is less than expected. Blue tiles indicate significant positive residuals, where the frequency is greater than expected. The intensity of the color represents the magnitude of the residual.